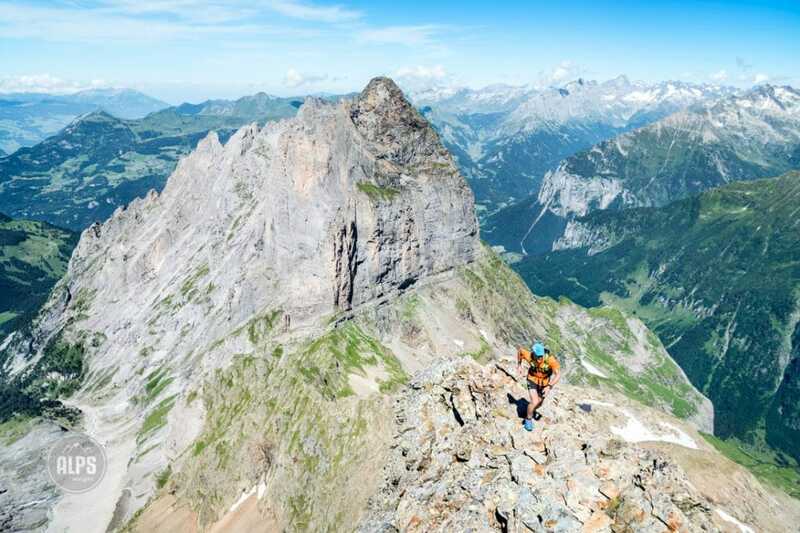 While the Dossengrat has a bit of easy climbing, it also has a bit of this. There is simply no way I could title this “Running the Dossen”. Yes, there is a great section to run, but this is most certainly, “Hiking the Dossen”. Hands are even involved to get to the top, but we’ll get to that. In 2015, Janine and I hiked the 3138 meter Dossen from Rosenlaui and loved it for its setting amongst glaciers and high peaks. We went up late to have dinner, and even a glass of wine, on the summit. For The Way Up project this year I decided to do it again, and in the same style, with our good friend Alister Bignell. Thanks to a 2000 meter gain in a 3.5km straight line, the peak qualifies as Way Up. These numbers also reveal why we didn’t run so much. It’s steep, fantastically so. After an initial steep forest trail before a beautiful cruise through a glacier carved river valley, you arrive to a wall. Here the trail takes a sharp turn, up. Cables, ladders and handholds drilled into the rock help you gain about 600 meters to the hut. This trail is not for those with vertigo or unsure on the feet. 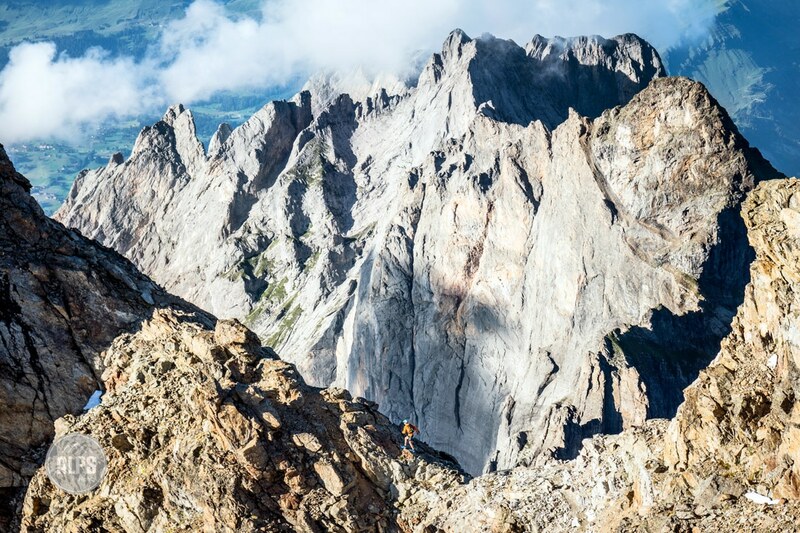 While still technically “hiking”, it is exposed with sections of easy scrambling. 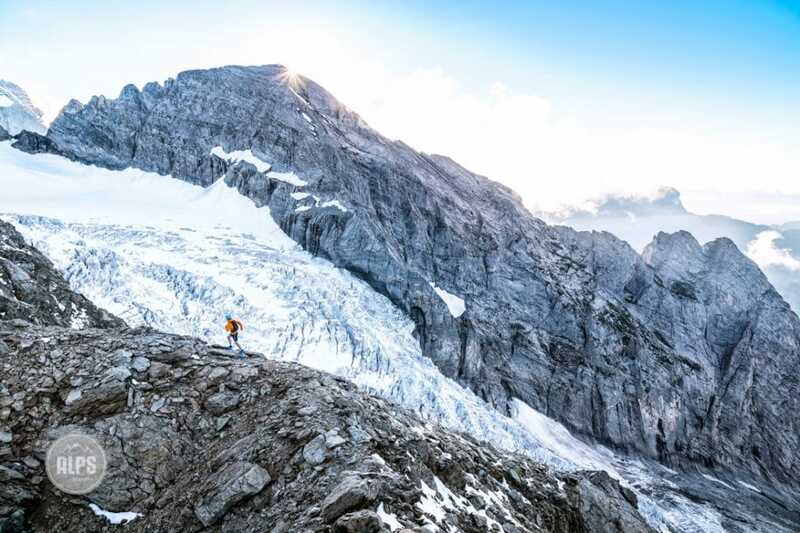 Many people hike to the Dossen Hut on the first day and then climb the Dossen early the next morning before continuing on a glacier tour that will eventually take them to the Gleckstein Hut and a descent into Grindelwald. Hiking up to the Dossen Hut from Rosenlaui is on a Swiss Alpineweg, which are steep trails with cables and ladders in place. In the background is the Rosenlauigletscher and Wetterhorn. Our goal was to be on the final section for sunset. This allowed for a late start from Rosenlaui, a break at the hut for drinks, a nap and dinner on the summit, and then a headlamp descent post sunset. A perfect, warm, still summer day were all in perfect combination and the day played out as we hoped. Once again people at the hut gave us curious glances as we cruised through mid-afternoon with running shoes and tiny packs on our way to the summit, then again in the evening as they all sat outside watching the sunset. In my opinion, the style in which we did the peak is something you never forget. Being out late in golden light and watching the mountains change from day to night is a wonderful feeling. To move through them at this time, feeling the temperature change, and finally getting to the point where you switch on your headlamp, is even more rewarding. On the west side of the Dossen you’ll walk above the Rosenlauigletscher. In the background is the Rosenhorn, a popular spring ski touring peak. The Dossen itself is an unremarkable rocky peak. What gives it life is its position and easy access to the alpine world. From the Dossen Hut there are two options to the top. One is to hike up the permanent snowfield to the Dossensattel and then follow the trail to the top. Or, what we chose to do is to follow the Dossengrat (grat = ridge) to the Dossensattel and again, the trail to the top. The Dossengrat is a lot of walking, but also requires easy climbing, made easier by in place cables. Nevertheless, it is slab climbing on good rock, comfort moving over rock is required. The grat leads to the Dossensattel where a trail, exposed in places, takes off for the top. 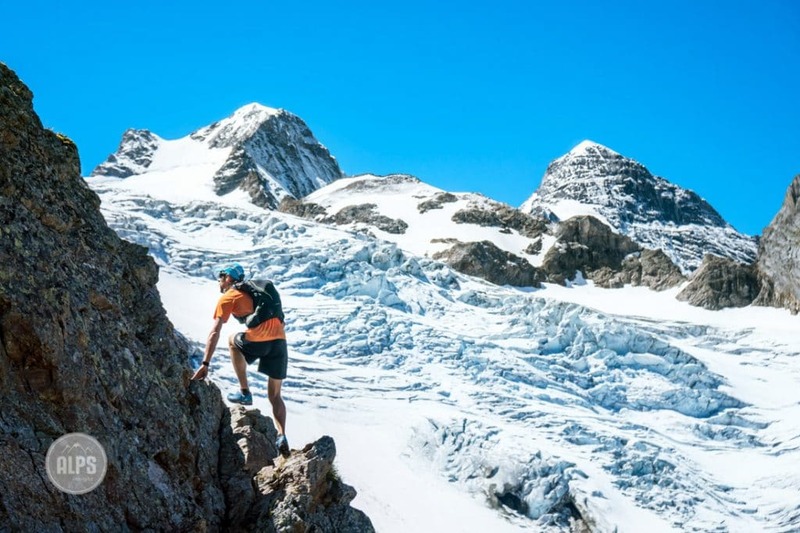 Finally, on the Dossen’s west side and just below the summit, you’ll walk along the edge of the Rosenlauigletscher just above where it begins to flow down in a labyrinth of crevasses and seracs. Here the glacier tour starts to either climb the Wetterhorn, or to cross over to the Gleckstein Hut. If you use the SwissTopo site you’ll most certainly be confused by the Dossen being spelled “Tossen”. Yet the hut is still Dossenhütte. This is one of the mysteries of how the Swiss use their language, which has no standardized written version. As everyone here says, “Just spell things like it sounds, or how you feel”. Confused? Me too. What’s not confusing is that the Tossen, or Dossen, or whatever, is a great day in the mountains. Alister on the Dossengrat. The Rosenlaui starting point is far below on the left side of the image, at the base of the peak behind, the Gstellihorn. Cables on the Dossengrat. Below on the right is the Dossen Hut. On top of the Dossengrat is the Dossensattel, where the alternate snowfield route also reaches. 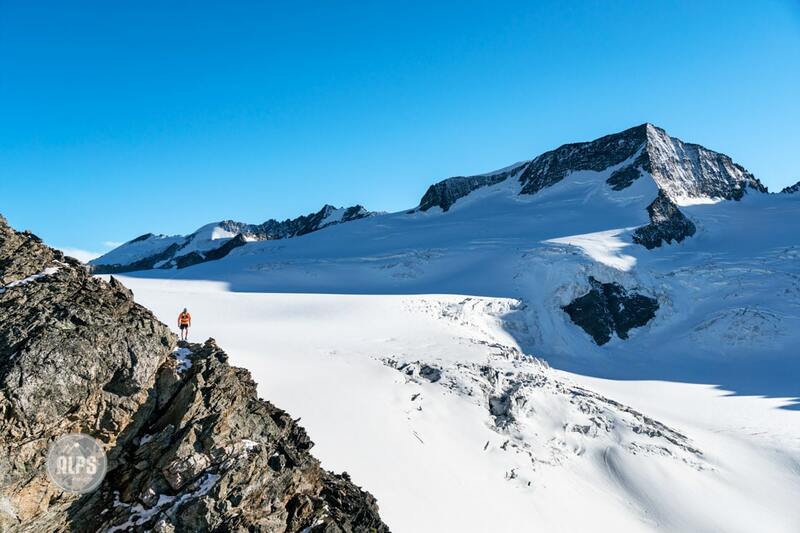 Alister Bignell on the summit of the 3138 meter Dossen looking out to the Wellhorn and Rosenlauigletscher. Alister starting down the small, permanent snowfield high on the west side of the Dossen. 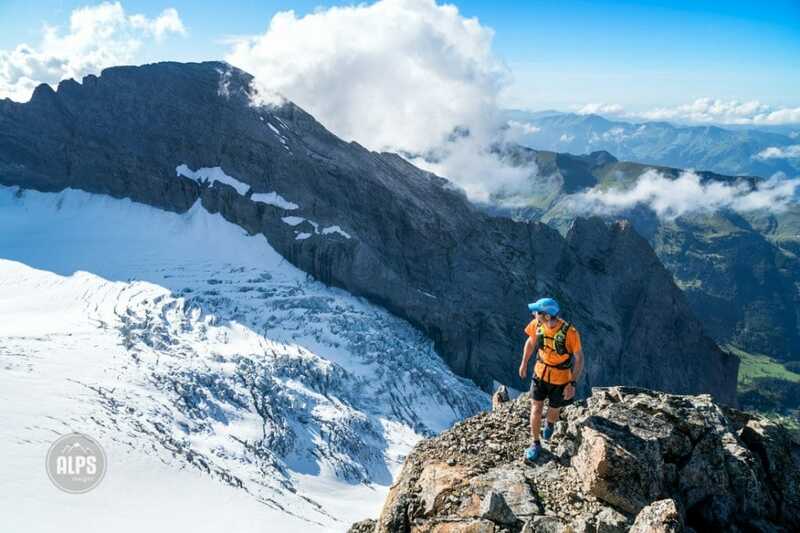 You see two kinds of people in SkyRunning, those coming from Trail Running and those coming from Mountaineering. I definitively come for the valleys, but every year I try to go higher and more technical. This run is the perfect one to help push yourself a bit further, it has been my testing ground for running the Glen Coe Sky Running Extreme. I guess this is about the limit of what you can do without carrying equipment 🙂 Everybody else I saw was roped in. 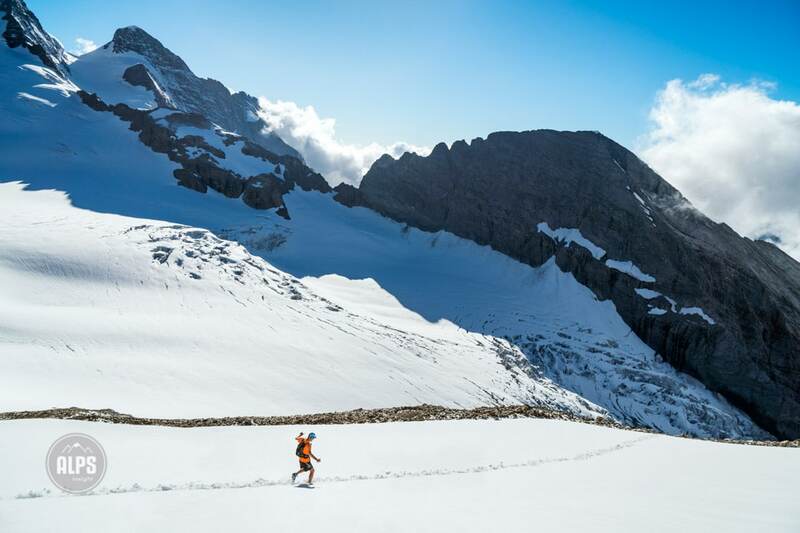 In spite of high temperature (6C at night), the snow field at the bottom of the Dossen was very hard – impossible to cross on running shoes. I thus had to go back down through the ridge (where I climbed up). Taking spikes or light crampons gives another option.